Praying with the heart, we empty ourselves like a prayer bowl. Last week I talked about how I go about prayer as an act of the heart, not the head, and about how when I pray I let my awareness rest in my heart, which is the part of me that is always aware of my connection with all things. OK. But then what? Then, once I have tuned into the energy of love that my heart is tuned to and I feel its subtle (and sometimes not so subtle!) vibrations, then I place into that field of love the person or situation that I am praying for. But here’s the thing. In this form of prayer I don’t place an outcome there; I simply place the person or the situation there, because within that field of love everything is already whole. There is no conflict or despair or suffering. So what I am doing when I pray this way is I’m placing the person or situation in the vibration of their wholeness, which already exists. This is an essential aspect of how I always pray. You see, if I come to prayer convinced that something is wrong and needs to be fixed, I am approaching the situation from the ego’s perspective. The ego lives within a story of lack and fear, which in the realm of love simply don’t exist. In order to be present fully to that realm of love it is necessary for me to let go of those illusions and to simply rest in the Reality of wholeness. 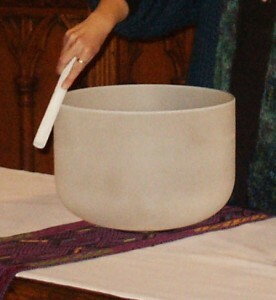 The image that comes to my mind when I think of this way of praying is of a prayer bowl. A prayer bowl needs to be empty in order to vibrate to its authentic pitch, and so when I come to prayer I allow myself to be empty. Empty of my own agenda, empty of my own fears, empty of my own grasping and striving (which are all ego based). I simply let the vibrations of the field of love, which I access through my heart, permeate the situation or person I am praying for, knowing that I am one with them. Next week I’ll say more about why the ego can be an obstacle when it comes to prayer. Stay tuned. I’m still going to read the next two weeks post however I think this will ultimately be my favorite. Susan, I’m really glad this post connected with you. Thanks for reading — and responding!